"A Woman's Place is in Her Home" gave me a much larger understanding of the issues confronting women and children who are homeless in Humboldt County.In particular, many of the statistics were horrifying, especially the 900 children who are homeless in this area. The professional and compassionate presentation of this problem opened up a dialogue with the audience after the performance that I attended, and allowed for discussion on ways to address this issue. I would like to see this performance offered in other places in Humboldt County, and to a wider audience possibly statewide, in order to stimulate ways in which these problems could be solved." "A Woman’s Place is in Her Home was a very powerful insight into the lives of local women struggling with homelessness. I was extremely moved by it. I became aware of blind spots I didn’t know that I had and activated a real and deep sense of compassion I didn’t realize was dormant in me. The cast respectfully and brilliantly told heartbreaking stories of local homeless women. They made us look at a harsh reality that most of us shuffle by on the sidewalks and avoid. It has been over a month since my attendance of the show and I notice a lasting shift in my perspective." "I think what really struck me about the show was how resilient women are. Women are home-makers, and this seemed to glow beneath the struggle of displacement and the sadness that accompanies it. The performers, professional and community, were well attuned to each other, the ensemble strong and even. I was particularly moved by the music, written by a woman I know who is a much loved musician in our county, and she too has found herself on the economic margins. " "For me the message hit home because I had been a single mom living in fear of the “what if I can’t pay my rent?”. There were so many times that I felt as though it could happen any time. The show described the very real situations that some people do experience. It was very powerful to hear the statistics at the end and I about lost it when the number of children in homelessness was given. The show boosted the compassion I already have for our homeless folks. Thanks for being a part of this." 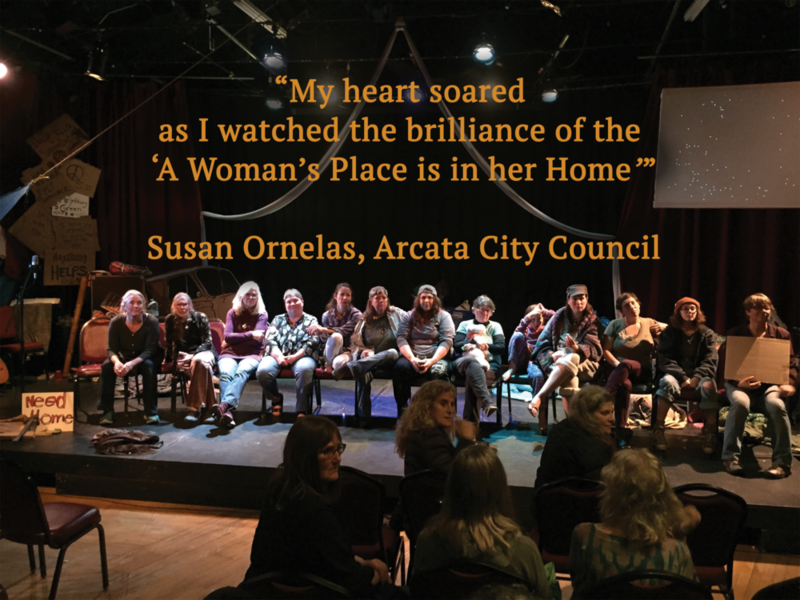 "I want to say that my heart soared as I watched the brilliance of the ‘A Woman’s Place is in her Home’ play at the Arcata Playhouse Saturday night, April 28th. The whole event was touching, from the music, performed by a young local professional, who herself has struggled with housing; to the stories, which were true, real and local - yet held universal value, and true life experience. It is painful at times to hear the truth, yet it is deeply meaningful, and informs us as policy makers as to how to better help. This is definitely a work worth investing in. Already powerful, but one can only see the future potential of the message. The music was memorable. The message, unforgettable." "Putting women's faces to "homeless," listening to honestly told stories of circumstances that led each to that nonplace was eye opening. Clearly portrayed was the desire each woman had for a home - something permanent, safe, something that was hers. The request is so reasonable, the desire so burning, the dangers and difficulties of their state so great one wonders how society can respond so poorly.This production is thoughtful, powerful, and instructive. Everyone should see it." "I was so happy to be witness to this amazing performance. I didn’t know what to expect and I had no idea it would be so musical and I loved that!! It was very moving, very thought provoking and really made me think about the way we look at other humans in this world. There was a gentleman in the front row by me and Sara who was crying. It was so emotional and moving to see it touch people in that way. I got emotional too. This was such an impactful performance and I think it would be good to see it done in high schools and other places in the community. Give our homeless community a voice." "A Woman’s Place Is In Her Home is a touching and insightful journey into a secret world that exists invisibly in our society."